HP Hood, the manufacturing company behind Blue Diamond Almond Breeze, is recalling more than 145,000 cartons of the brand’s vanilla almond milk. The reason? They may contain cow milk. According to a release from HP Hood, the affected cartons have a use-by date of September 12, 2018, and were shipped to 28 states, including New York, Pennsylvania and Texas. The company, which manufactures Lactaid along with its own dairy products, was alerted to the potential almond milk problem back in June, when a consumer contacted them about an allergic reaction. After more than a month of investigations, HP Hood confirmed that dairy milk had “inadvertently” entered the processing equipment for almond milk, company spokesperson Lynn Boshan told Huffington Post. “We have done a comprehensive review into the situation, and we’ve made corrective actions and made changes to our process to ensure that this will never happen again,” Boshan said. That might be little consolation for almond milk drinkers with a severe allergy to cow milk. Not to be confused with lactose intolerance (which affects the digestive system and is often self-diagnosed), a milk allergy involves the immune system — and reactions range from mild (hives) to life-threatening anaphylactic shock, according to nonprofit organization Food Allergy Research and Education (FARE). “Cow milk allergy is the most prevalent food allergy in young children and can cause a severe, even fatal, allergic reaction,” Lisa Gable, CEO of FARE, tells LIVESTRONG.COM. It's estimated that 2.5 percent of children under age 3 and 0.2 to 0.4 percent of adults in the U.S. have a milk allergy. The Food and Drug Administration calls this problem “cross-contact,” but doesn’t require manufacturers to include a warning label about the presence of potential allergens from processing equipment. That leaves it up to consumers to do their own digging into a company’s manufacturing practices and stay up to date on recalls like the current one. Do you drink almond milk? What are your reasons for drinking it? 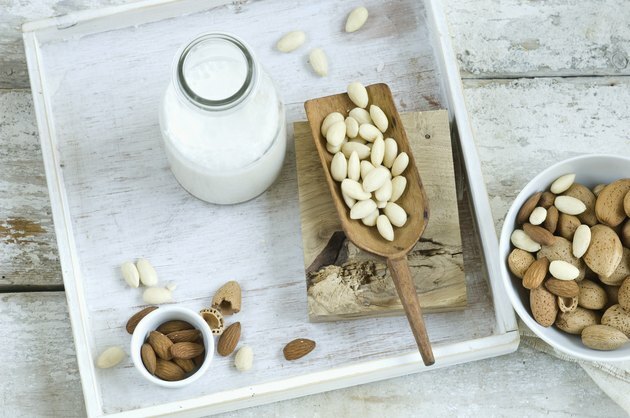 Were you aware that almond milk could be processed on the same equipment as dairy milk? Would that affect your decision to drink it? Let us know in the comments below!